“Route 66” features jump blues – that raucous child of country blues and swing jazz that burst onto late 1940’s America squalling and jiving to a hard-driving backbeat, boogie woogie piano triplets and bootin’ and honkin’ muscular tenor sax blasts. The simple lyrics were earthy, sometimes downright raunchy, and spoke primarily of love, loss and drinking, sung by big voiced shouters, both male and female, who managed to be heard over the din. Its energy and enthusiasm were infectious, filling dance halls, ballrooms and tobacco barns to the rafters with euphoric black and white fans and the impact it made on segregation in Jim Crow American cannot be overstated. For one glorious decade the big beat reigned supreme and changed the direction of American popular music soon to be known as rock ‘n’ roll. There was an enormous number of jump blues records cut between 1945 and 1955 with new independent labels cropping up – Specialty, Modern, Aladdin, Swingtime – filling the niche for Black popular music that was being ignored by the majors. Each geographic area of the country had its own unique style of music and you are likely to hear a bit of each on “Route 66.” The Midwestern cities of Kansas City and St. Louis, with their rich heritage of hot swing bands and leather lunged vocalists, produced Big Joe Turner, Little Jimmy Rushing, Jimmy Witherspoon, Count Basie and the Jay McShann Orchestra. Texas was home to some fine Boogie Woogie piano with Amos Milburn, Floyd Dixon and Ivory Joe Hunter. The West Coast favored an urbane brand of jump blues that owed much to jazz. The bands of Johnny Otis, Joe Liggins, Roy Milton and the suave cocktail blues of Nat Cole and Charles Brown were in sharp contrast to the frenetic sax blasts from L.A.’s Big Jay McNeely, Joe Houston and Chuck Higgins. New Orleans infused its R&B with a cheerful piano and horn-driven style with a distinctive second-line, Dixieland strut that was identifiable with Dave Bartholomew, Fats Domino and Paul Gayten’s band. As the host of “Route 66” I feature Tampa’s undervalued blues and R&B contributions, much as I did with Atlanta’s history during the 12 years the show aired on WRFG. Central Avenue certainly saw its share of entertainers before it faded. At the Apollo Ballroom on any given night you might find a young James Brown with his Famous Flames, Cab Calloway or even the late, great genius of the blues, Ray Charles. I am very interested in learning the heritage of my Tampa home and sharing it with others through music and information. Listen to “Route 66” on WMNF, 88.5 FM, now on Friday nights from 7 to 8 pm. It’s history you can dance to! For more about the show, check out the Route 66 webpage! Little Richard, Patron Saint of Rock ‘n’ Roll Calendar for Route 66! 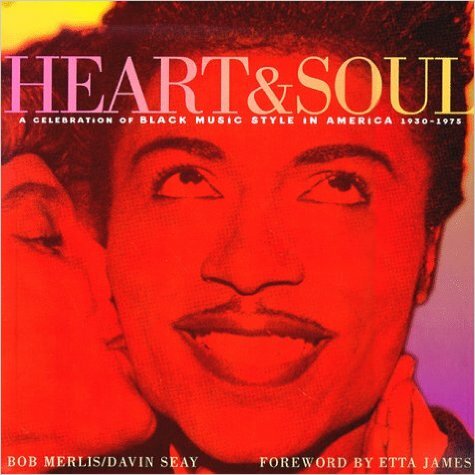 Mark your days with Little Richard, the PATRON SAINT of ROCK ’N’ ROLL! Everyone needs a calendar, and then you still have art work when the year is over. This beautiful hand made calendar is for the year 2019. It is approximately 9.25 inches (23.5 cm) high and is in full color. It comes packaged in it’s own translucent vellum envelope.Perfect for mailing and gifting! The calendar was created by Los Angeles based artist Vicki Berndt from her original painting St Little Richard 2006. 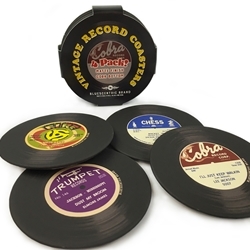 This four-pack of old vinyl record-themed coasters are sure to be a hit for the true music lover in your life! The 3.5 inch coasters come with a durable matte finish, cork bottom, a steel body, and a whole lotta soul. Each coaster featuring one of four long-deceased record labels from the 50s-70s Rock n Roll and Blues eras. Route 66 Rock’N’Roll Air Freshener! Your car smells like Diddley!” Dig these fabulous two-sided air fresheners featuring an exclusive star on one side and perennial favorite Esquerita on the flip! Gorgeous scents for a total experience. 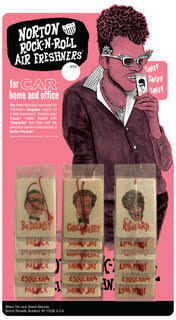 Imagine your draggin’ wagon tagged with “L’il Richard” and filled with the delicious signature fragrance of Georgia Peach! Wrap up your adult beverage with one of these fine koozies and support Rte 66 and WMNF at the same time! Choose which one you want – Bo Diddley or Chess Records Label or 45 Adapter. This intimate portrait of legend B.B. 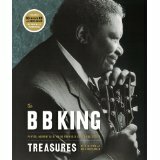 King celebrates the blues singer and guitarist with 75 color and black-and-white photos, facsimile reproductions of items from his personal archive, and–similar to the popular “The Sinatra Treasures”–an audio CD featuring unreleased music and interviews. As the host of "Route 66" I feature Tampa's undervalued blues and R&B contributions, much as I did with Atlanta's history during the 12 years the show aired on WRFG. Central Avenue certainly saw its share of entertainers before it faded. At the Apollo Ballroom on any given night you might find a young James Brown with his Famous Flames, Cab Calloway or even the late, great genius of the blues, Ray Charles. I am very interested in learning the heritage of my Tampa home and sharing it with others through music and information.